UNITED NATIONS, December 22 -- The post-employment restrictions on senior UN officials were significantly eased from an earlier draft, in a finalized policy announced on the last working day of the Kofi Annan administration. A June 12, 2006, draft of the policy provided that "former staff members at the Assistant Secretary-General level or above are prohibited from making, with the intent to influence, a communication to or appearance before any staff member of the United Nations, regardless of level... This prohibition is effective for two years." The draft policy was prepared by the office of then-Under Secretary General for Management Christopher Burnham, who has since shifted to the private sector at Deutsche Bank in New York. Speaking to reporters on his last day at the UN on November 15, Mr. Burnham promised that the anti-revolving door policy would be issued before the end of the year, and that it would set a "gold standard" of good government. The final policy, however, characterized as "unprecedented for the UN" by Kofi Annan's spokesman Stephane Dujarric on Friday, contains no restrictions on Assistant Secretaries-General nor on the outgoing Deputy Secretary-General, Mark Malloch Brown. Rather, the final policy is explicitly limited only to "staff members participating in the procurement policy." The promised gold standard had turned to brass or worse, one wag noted. At Mr. Dujarric's final press conference, Inner City Press asked him to explain the changes from the draft to final policy, and who was responsible for them. A Security Council diplomat as well as numerous corroborating sources have indicated that Deputy Secretary Mark Malloch Brown was responsible for the weakening of the prohibition, effectively exempting himself from its reach. Mr. Malloch Brown appeared at the beginning of Friday's UN press conference, but left before any questions could be asked. Mr. Dujarric declined at the press conference to comment on the draft, and called the final policy "strong and sound." Also in the press conference, many journalists thanked the outgoing Mr. Dujarric for help he'd given them in reporting about the UN. In full disclosure, Inner City Press said "it's been a pleasure," which the spokesman reciprocated. Later a UN official, who asked not to be named for a variety of reasons, justified the deletion of the restrictions on senior officials as necessary in order to continue recruiting highly qualified people into United Nations service. The example of the head of UN peacekeeping, Jean-Marie Guehenno, was offered: what if Mr. Guehenno, upon leaving the UN, went back to working for France but then could not contact the UN? Inner City Press asked, "Why not exclude service to a member state from the lobbying restriction?" The official pointed out that some of the least dynamic UN officials are forced on the UN system by states. The official argued that the policy is "a first step," which will next to applied to the UN's funds, agencies and program, such as the UN Development Program, and that then its (re-) extension to senior officials might be considered. Many UN watchers are concerned that incoming Secretary-General Ban Ki-moon may not be committed to UN reform and transparency. Mr. Ban, however, has emphasized in recent speech a need to restore the credibility and integrity of the UN, an implicit critique to which Mr. Annan has not taken kindly. Asked at his final press conference to comment on Mr. Ban's lines, Mr. Annan said curtly, "You'll have to ask him." Mr. Annan himself was not available for comment on Friday. 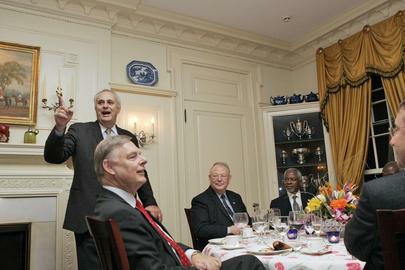 He strode through the Security Council ante-chamber accompanied by bodyguards and Mr. Malloch Brown. Friday was his last day of work at the UN. He will, his spokesman says, remain in New York and be available if necessary, for example on Darfur. The Annan era is over, and at least on the post-employment restriction segment of UN reform, goes out with a whimper rather than a bang. The degree to which Annan-era Assistant, Under and Deputy Secretaries-General lobby the UN in the coming two years bears watching.